I'm new to riding street and new to Guzzis. My first bike is a 2010 V7 Classic, and I LOVE her (her name is Rhiannon). Anyways, I really feel the power at like 5 or 6 rpms, but when I'm cruising down the road, I'm riding at about 3 or 3.5. Anyways, thanks for any info. **C **C Welcome. Guzzi's are known for their torque. I regularly ran my V7 at 3.5 or 4 down the road. Check your oil levels regularly 'til everything gets worn in a bit. They are great bikes and a blast to ride. Any questions, feel free to ask, this forum is a wealth of information and knowledge. First, welcome here, it is a good place with very knowledgeable MG cultists. 3500 RPM cruise is reasonable depending on gear and terrain. I tend to cruise at 4000 rpm, but keep the bike mostly between 5000 and 6000 with bursts to 7 grand under flogging conditions. But, I am old hooligan. Enjoy! You'll get a lot of different opinions here, all valid. 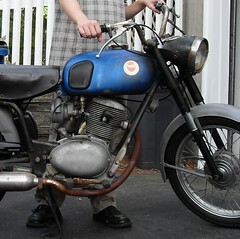 I usually sit at 3500-4000 rpm on my '11 Classic, but I have no concerns taking it to 6000-7000 when I want to giddy-up. The higher revs won't hurt anything, and the bike just sings at those revs. Regardless, best to keep an eye on the oil level because there's not a lot of it in these engines. And make sure the dipstick is screwed on tight. Thank you for the info guys!! Much appreciated! I tried posting a few images, lets see if it works (coming from my FB). The black is my 2010 V7 Classic (my friend sold it to me for 5k, has 3k miles on it and good as new!). The red/orange is my GF's Triumph Bonneville, she loved the Guzzi look but it's too tall for her, like way too tall, the bonneville was a good 2" shorter. Works perfect for her! Just been riding around town lately, havent hit the freeway yet. Again, thanks for the info! 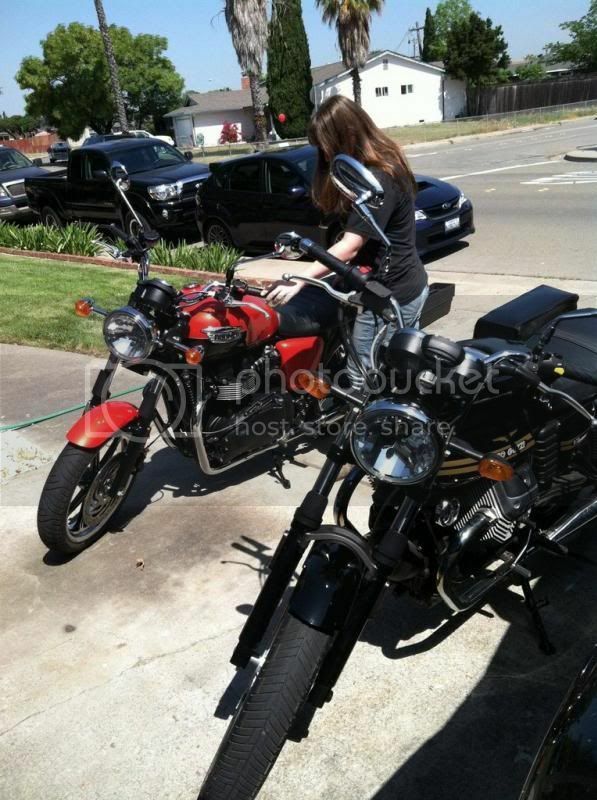 Gonna help me ride my baby (her name is Rhiannon) better! Ok I like 4k then burst it up to the higher levels, feels like it's more responsive that way! I notice I dont have a red line on my tach... is there a danger zone I should stay away from? I haven't hit the rev limiter on mine, nor have I had a need to explore that side of the tach. I don't think there's much to be gained above 7000 or so, except for more vibes. Someone here will know the number, but I'm guessing it's around 8000 or so. 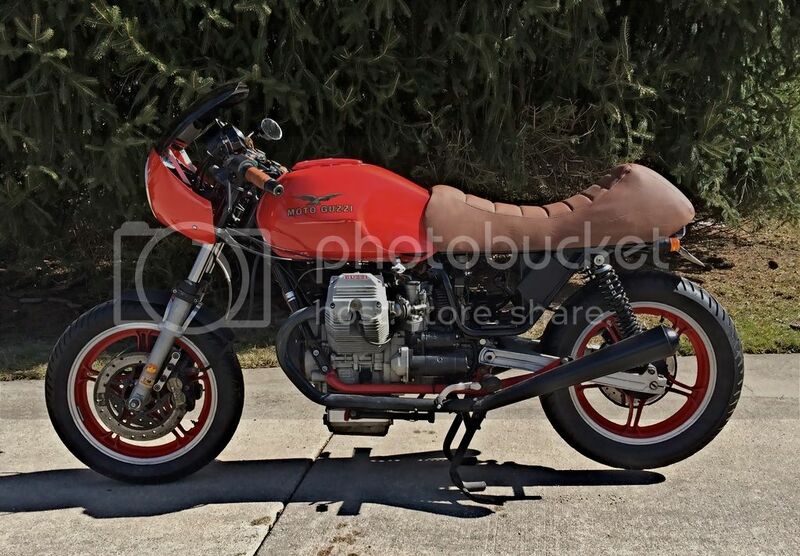 **C The Guzzi's have a rev limiter built into the ECU. It'll shut you down if you rev too high. I'd think that 8k would be pushing it a bit, but I'm an old guy tend to just cruise around playing with that big torquey engine in the Bassa. Ah I see, thanks!! I doubt I'd hit it, i'm still being mellow and learning the best way to ride! What is your Facebook name? So we can see your pix. Ride it where both you and the machine feel comfortable. End of story. True true!!! Thank you! Yeah, I will still be testing the rpm's and see what feels good. So excited, I LOVE my baby! Wish I could post pics, not sure, it didnt really work for me. They are a great engine - plenty of usable torque down low but love to howl too. I only have one golden rule - I don't change up to 5th until I am riding above 50 mph and change down to 4th if speeds drop below that. Fellow first time Moto Guzzi / V7 Classic owner here, really, really enjoying it. Very different from previous bikes I've owned, all of which were Japanese, high revving bikes. It's nice to have the torque and power at low revs. Welcome to the motorcycle community! I'm sure you've heard this from others, but I highly recommend MSF courses to any new rider I meet. If you haven't taken their basic rider course, definitely check out options in your area. In some states (Washington, for example), courses are even partially subsidized, and successful passage of the course grants you a motorcycle endorsement. Its a great way to learn and acquire skills in a safe and controlled environment. Regarding photos -- I used an image sharing service, imgur.com, to share photos on another thread. It was easy to do; go to imgur.com and click computer under Upload Images. You can then select a photo of your bike from your hard drive to share. Once it's uploaded, you'll see some links that you can use to share the photo. I don't have any affiliation with the service, but it seems to work well. Good luck! I have taken the course, it was a few years ago. I want to do the basic rider 2, it's, from what I can tell, the same thing but for those who have their own bikes and jus want to brush up on those essential skills... probably no "this is how you shift" stuff. Good idea w/ the photos! See if this link works, of course they came over sideways, sorry, I'll fix tomorrow, running off to bed! Thanks for all the helpful info and welcomes! Much appreciated! Ride it where it's happy (smoothest). I found the sb's to be happiest around 4200-4500 rpm so there she sat. Enjoy! I'm looking for Pyoung to chime-in here. 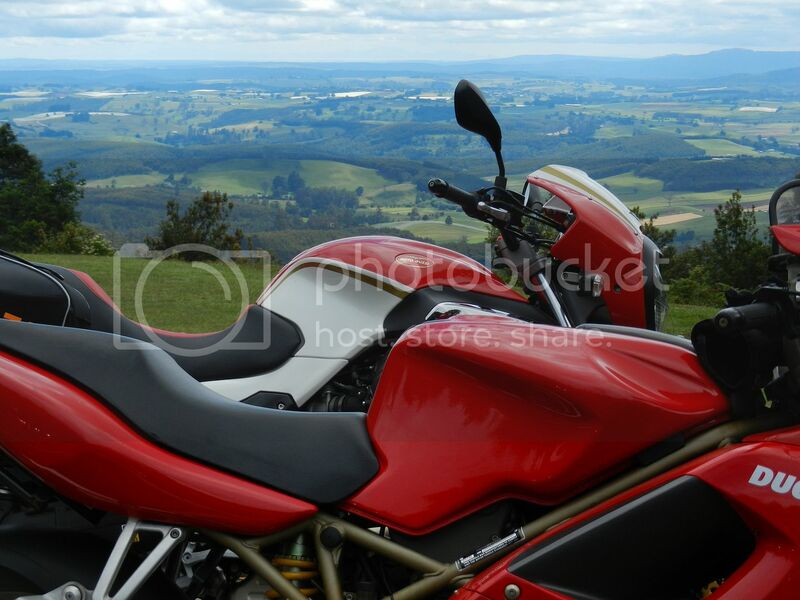 I've been getting wonderful ride reports from him pertaining to his new red V7 Classic. He's trying to tip me over the edge. He claims 70 mph is very easily attained on the freeway and he is turning about 4500 at that speed. When new, it had a definite sweet spot at 4k rpm. After many miles and engine modifications the sweet spot is now less well defined, but approx. 4,200-4,500 rpm. Oddly, many report 4k to be weak point, and dynamometer graphs prove it. There's a dozen dyno graphs on the Yahoo group, on the Files page; http://autos.groups.yahoo.com/group/MG_750/ To include a German example with a big bore 820cc kit. Some don't find the 4k weak spot at all, and it appears that it can be tuned-out by minor/major engine mods. My first Guzzi was a V50II back in the day. I thrashed that thing mercilessly, often two-up, all over the UK and France/Benelux often maintaining speeds well in excess of 70mph for hours on end. It wasn't until I started working on them professionally that I found out what a grenade they could be! Hindsight makes me think that a lot of the problems were probably more the result of neglect and poor servicing than design. Basically though if you can't maintain 80+ mph on a V7 there had to be something wrong with it! Yes, you need to check the oil every fill-up and I'd fit a sump extension but the idea that you can't 'Travel' or have fun on one is silly. If I wasn't in love with my Mana I'd be sorely tempted by a single TB V7 as a solo tourer. The only downside in my book is the ancient gearbox and primitive suspension. The engine nowadays is a gem. **C The V7 is very capable of freeway speeds. I rode mine to the MO campout a few years ago and a lot of the return trip was on a toll road with a 75mph speed limit, and I many times found myself pushing 80. They are great (not so little) bikes. The only reason I got rid of mine was the ergonomics were wrong for me. (Built like an Orangutang) The Bassa fits me much better and it's so high geared I rarely get out of 3rd gear in town and only use 5th on the interstate or aforementioned toll roads. Freeway riding is a doddle. Just stay out of people's blind spots, then you can relax. As others have said, there isn't much performance to gain above 6,000 rmp. It won't hurt the bike, but there's just not much point to it. The oil filler cap on the V7C can be a pitfall, but just make sure the rubber o-ring is seated before tightening. I waterproofed a few pair of shoes before learning this simple rule. I'm still wearing those shoes, but sometimes wonder whether I should dip the right one in oil for better color matching. Lots of folks like the Dart Windscreen on the V7. It's cheap, takes 10 minutes to install, takes just enough wind off to make freeway riding a little more relaxing, and aesthetically it helps "complete" the look of the bike. Love hearing so much good info on my bike!! Dave, I started w/ dirt in about .... 2004, had a 87' XR250, WAY too big for me (height and weight wise), but it was a good learner to see if I liked riding. Realized the suspension was shot etc... got a CRF230 and away I went!! I love that thing! She's still my baby! Unfortunately, I'm self taught, well taught by other dirt riders and self taught.... some riders that have been riding for years, but my main "sensei" had just picked it up and started taking me out, he was fearless and a great teacher in his own right, except he didnt realize my beginner-ness and we would hit these trails on my old 250 that were black diamonds! Sink or swim kinda learning with him...it was great though, wouldnt have traded those days for the world... was riding every weekend for at least three years.... trucking my bike up by myself to the middle of the mohave desert after work on a friday...getting riden in by my two friends who were there already... hehe...good times! One thing I do miss about SoCal...Cuddeback Dry Lake, you can shoot your guns, ride your dirtbikes and camp... stimulation overload for me! I definitely have bad habits from riding dirt tho, I am trying to train myself out of putting my foot down to feel stable and for my crf, I stand A LOT, it's just bumpy and squirmy, so my hand position, I think, isnt proper for riding a street bike, just trying to train myself out of those habits, seem to be doing ok. Funny thing tho, after getting my street bike, if I HAD to sell one... I mean, HAD TO, I might get rid of the 230!! I duno what took me so long to get to the street! That ride will take 4-5 hours if you stay on 101, but I think you meant route 1, which hugs the shoreline most of the way. Route 1 to San Luis is more like 6-7 hours, but well worth it. From Freemont, you might want to take 101 to Salinas and then cut over to the coast from there, to save time. Alternatively, you could cut over at 84 which takes you past Alice's and is great riding all the way to Santa Cruz. When you get to Morrow Bay you have the option of cutting over to Paso Robles on 46, which is a fantastic 20+ mile stretch of road, but the detour will add 45-60 minutes to the trip. I did route 1 down the coast a couple times on my V7C, and it's a great bike for that road. Route 1 is not a race course. Take it slow and enjoy the scenery. That happens to be what the V7 is best at. 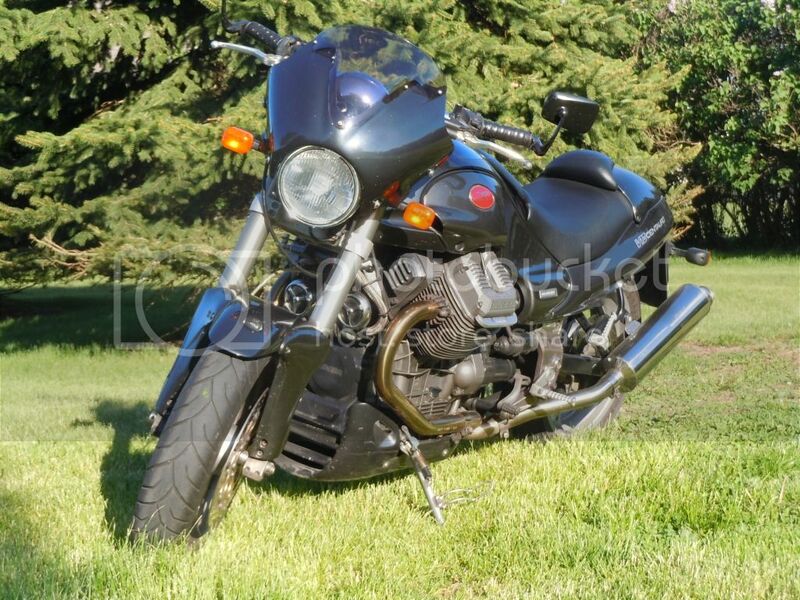 You might also want to meet up with the Bay Area Moto Guzzi group. There is a Yahoo group page for them, which I don't have the addy for right now. Since they are primarily in the south bay, you're well positioned to become one of the gang. I'm pretty far north of there. Eileen, Judging by the name of your scoot, you must be a Fleetwood Mac fan?? I came from an enjoy it but don't abuse it school, meaning ride it like you bought it and paid for it and pay for all maintenance and repairs on it, not ride it like you stole it. That also means don't lug the engine too as that's not good for it either. I don't have a V7 but it's on my short list for next bike. Obviously 3500 rpm is 3500 rpm regardless but it's also different depending on which gear you're in. I doubt seriously 3500 is too low rpm in any gear although in top gear it probably doesn't give snappy performance. As others have said, you have to find what feels comfortable to you as it's your bike. My comments aren't suggestions for you, just statements of what's me. Congrats on a cool bike. Enjoy. Adan, Yeah, we take 101 I believe all the way down last time (880 to 101) so we didnt hit the coast the whole way, but the route by Alice's and on highway 1 sounds like a good one, I would totally do a longer trip. I just assume I would be stopping a lot to rest my eyes, eat etc... Yes, I am NOT a racer and probably not going to be one...although, I saw a Triumph Street Triple, if I did want a more sporty bike, that might be it! I digress. But, right now, I'm a take it slow and enjoy rider... actually, I ride dirt like that as well, maybe a little more aggressive but yeah, I just enjoy being out there on two wheels! If you're ever up for a trip down that way, we'd love the company of an experienced rider! 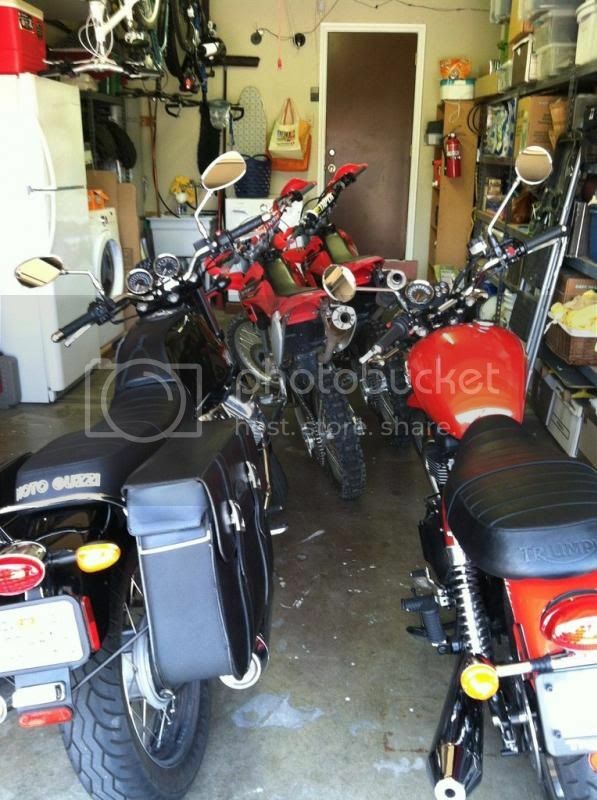 I'll try to find the south bay moto guzzi group, thank you!! GuzistaJohn, I am a Fleetwood Mac fan! Was lucky enough to see them in concert as well! Although Christie McVie (sp??) wasn't there, but it was still great. When I first test road this bike at my friend's house, all I thought was "she rings like a bell through the night, wouldnt you love to love her!" LDB, definitely, I treat all my toys well... I am going to ride her around today and try it at like 4, I've ridden at 4 or 4.5, I just wasnt sure if maybe I was running it too hard, but I wasnt thinking so, casue it was more responsive for sure. Thanks again everyone, great info! Keep it coming! Dirt riding has given you a feel for the dynamics of low traction riding that most street only riders never learn, so that is a great positive. The thing to do, and it sounds like you have already started, is to get a good instructional book (Lee Parks, Nick I.) or video that shows proper position and bike control, then consciously practice doing things the right way, like keeping the feet on the pegs and body lean, which are a little different than dirt riding. Soon you will transition back and forth and rarely miss a beat.